On Saturday I got over to Alameda early to drop off a Christmas present for framing at Urban Forest - (I know the holiday is far off - but I like to get things done and out of the way early) It should be ready in a couple of weeks. I then headed over to NIAH with a list in hand - I arrived and grabbed a basket and was loading it up and in walked Valerie. She is just as nice as her blog led me to believe. The last time I was in the "Stack" I had missed her by just three hours. We just shopped and talked and shopped and talked all afternoon. 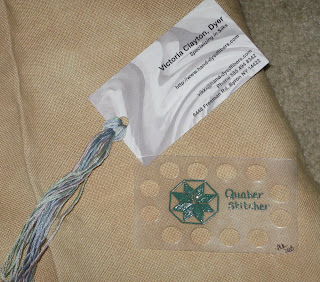 I picked up lots of floss for different projects and quite a few pieces of linen for future exchanges. 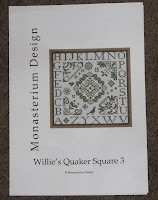 I also got my copy of the Preview Ornament Issue form JCS. 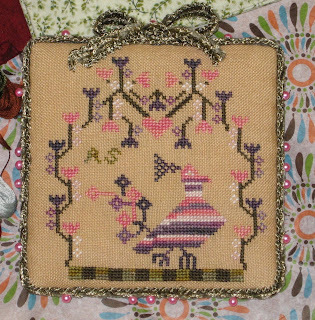 Not only does it have the ornaments but it also has a memorial sampler chart I had read about. It was such a fun day I really enjoyed meeting Valerie and we live so close here in the Bay area it was about time - I am really glad she suggested meeting up!!!! This one has JU-JU Bee in the background. He is an older brother from and earlier litter. Sugar really had no escape from these hungry little mouths and she is really very patient with them. This will be Sugars last litter as she will be getting fixed after she "gets back to normal." The only stitching I got done was exchange stitching so no snaps there. There was a couple of movies - "Letter of Introduction" - 1938 - The movie was really very good - but, there were the very long parts with Edgar Bergen performing with McCarthy and Snerd that were odd inclusions - but fine performances by Adolphe Menjou and Andrea Leeds... there was even a small but good part for Eve Arden. The second flick was "Keys to the Kingdom" - 1944 with fine performances by Gregory Peck, Thomas Mitchel, Vincent Price, Rose Stradner and Benson Fong. This is a move worth seeing. Well, let's us see - I finished another exchange last night - no snap. I am mailing an exchange this morning - no snap. 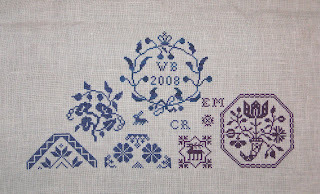 I put this HOE - Freebie Exchange together for Veronica - after looking at her blog - which has the feel of soft Victorian colours - I chose this Au ver d'Soie orchid colour. 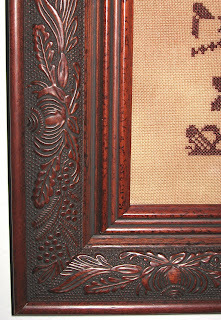 The pattern is from "with my Needle" - I finished it off with some lace and I think it turned out pretty nice. I included some fabric for finishing and some HDF silk. Also some hand lotion and some "Summer chocolates" from a local chocolatier - Joseph Schmidt - I thought I wouldn't be able to get them this year as I had not seen them anywhere - these chocolates come in one of the "Special Edition Boxes" which he has made - makes it nice as the boxes change every year with different hand painted designs. I have heard that Veronica likes what I sent so I am very happy about that!!! 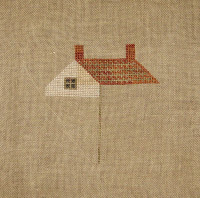 You should check out her blog as she has some really wonderful spinning and weaving pictures!! Going out today is my HOE - LHN Exchange - it has quite a ways to go. 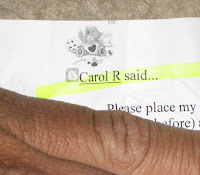 Also leaving is the Grand Blogiversary award for Carol in Deal, England. Last night the TCM - "Images of Asians in Movies" was "The Joy Luck Club" 1993 - one of my favorite movies - and as usual it turned into a snivel fest at the end!!! if you haven't read the book - you must - as the book is better than the movie. And there you go - another week gone by!! Tomorrow I am meeting up with Valerie at NIAH so that will be very nice to meet face to face!! I had two movies from Netflix to watch - Playing on TCM was more of the lovely Sophia they showed "Boy on a Dolphin" - 1957 not one of my favorites, followed by the big budget spectacle that is "Fall of the Roman Empire"- 1964 - I have the collectors edition of "FRE" got it when it came out as I really like this bloated colossus of spending money! The Netflix movies that I watched were "Kiss me Stupid" - 1964 - staring Dean Martin, Kim Novak and Ray Walston - was quite a pleasant surprise as a kind of cynical comedy. Directed by Billy Wilder and shot in B&W I really enjoyed this flick and will probably try and get a copy for my DVD collection. This was followed up by "The World of Suzie Wong" - 1960 TCM showed this earlier in the month but I missed it so I moved it to the top of the queue - I really enjoyed this as I like William Holden and Nancy Kwan was truly in command of her character. I did watch two flicks on TCM as part of the Asian Images in Film series. The first was a movie I had never heard of called "The Mountain Road" - 1960 with Jimmy Stewart and Lisa Lu. About 8 demolition men travelling in front of the Japanese offensive in WWII torn China and all the issues arising from the culture clash between east and west. It was a very different role for Stewart and Lu was really wonderful as the widow of an executed Chinese General travelling with the group. She became the voice of China to the Americans. The second flick is one of my favorite musicals - "Flower Drum Song" - 1961 This is one of the most entertaining musicals and worth seeing!! Great songs and musical numbers. The oddest thing about this movie is that the majority of the actors are Japanese and not Chinese - but a small point and much better than non-Asian actors in the rolls which is what would have happened if the movie had been made earlier. Just a heads up for August on TCM - Once again they will be doing Summer under the stars..... where everyday they showcase a star and their movies - always a wonderful way to see some great movies!! Another evening of exchange stitching. I am getting two of them out in today's mail. I have also sent out reminder emails for next months SBBC partners - don't forget to post when you send and when you receive - Thanks!!! The weekend was spent stitching and finishing exchanges. I have quite a few obligations coming up and so I am focused on that for the next few days. That means that there are no stitchy snaps. I did see quite a few movies this weekend - My Netflix brought me a Joan Collins Film Festival - with three of her movies - "Seven Thieves" - 1960 with a great cast, Edward G Robinson, Rod Steiger and of course Joan Collins - a great caper film!! The other film with JC was "Stopover Tokyo" - 1957 - an assassination movie from the Cold War. The third film was "Road to Hong Kong" - 1962 - the last and the least of the Hope and Crosby road films - it was pretty bad - that's the best I can say about that!! Short and sweet today - the weather has finally gotten back to normal with the highs today around 60 degrees!! instead of that 90+ last Friday!!!!! The TCM Images of Asians in Films continued on last night and I saw three of the movies presented. They were - "Bridge to the Sun" - 1961, "China Doll" - 1958 and "Sayonara" - 1957 all three films dealt with East -West personal relations and their problems. I am finding these films really interesting! - I really liked the mottled effect of the dye on this section. 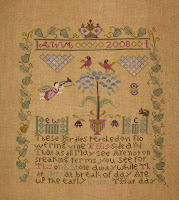 "Do you currently subscribe to any stitching publications or have you in the past? (Either in print form or online) If so, which ones? The only stitching publication I have ever subscribed to is the online "The Gift of Stitching." I usually only buy a magazine if there is a project I like and feel that I will do. Usually the magazine projects do not appeal that much to me. 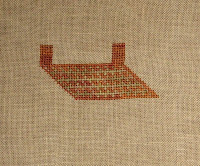 It was for a specific project that I started to get TGoS the project is a year long publication of a world stitching sampler that I really liked. The movies last night were from a the TCM Star of the month - Sophia Loren - just a spectacular actress who is not only stunning to look at but brings such a wonderful quality to all the rolls she plays. The two movies I saw last night were - "Black Orchid"- 1958 and "A Breath of Scandal"- 1960 - Both very good movies and worth seeing. And so it goes my friends - Thank you all so much for stopping by!!!!! Last night I jumped right in and started to stitch on my RR for the Halloween RR that Donna is running - Witching for Stitching. I have already laid the entire piece out in paper and just felt I should start stitching - I figured what is the worse that could happen - frogs!! So I have a pretty good start on the border. I think that I want mine to have a spooky sampleresque feel to it. I will have the flying skeletal witches with pumpkin (from Tomb with a View) on the top in the middle then 7 "squares" beneath that for the stitchers to stitch their contributions and along the bottom some houses, trees, pumpkins and other fall/Halloween things. Depending on how everything falls I may run vines and leaves around, but I am not to stuck to any pattern or idea. I really want to get a majority of my stitching out of the way before I send this one out so you will be seeing lots of it over the next couple of weeks. I am just overwhelmed by ALL the super nice comments!!!!! Thank you so much!!! You know when I look at this piece that took a little time to stitch I think back to some of the places that it got worked on. It was stitched mostly at my home here in SF but I also stitched some on it at my sisters in Washington and also some on the floor in airports and even over at friends house. 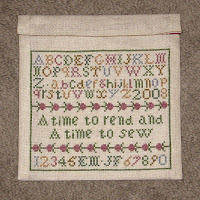 So I look at this sampler and think back and remember as I hope others who look at it may think and remember - isn't that why we stitch some of these things - for the future. I really think my photos taken at 11:30 at night do no justice to these pieces. The linen is a really pretty antique white, but you would never know that by this snap! Now it is on to Donna's. Last night the movie was "A Summer Place" - 1959 a very soap opera movie with some gorgeous music. Starring Richard Egan, Dorothy McGuire, Sandra Dee and Troy Donahue. Thank you all again for the nice comments they mean a lot to me!!! A super visit, BP framed, exchange arrived, some stash and a Happy Birthday!! The weekend stared with a great visit from Michele and her DH. 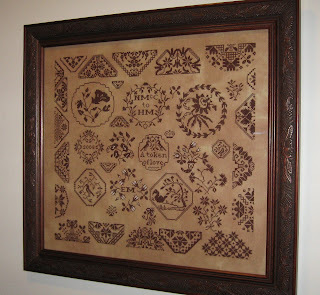 It was such fun to meet another Stitching Blogger. This is such an anonymous venue that to meet face to face is great!!! We got together on Saturday night down on Columbus street where we sat around talking for what seemed like a few short minuets but was actually a few hours!!!! I am now the proud owner of one of Monique's wonderful thread holders. 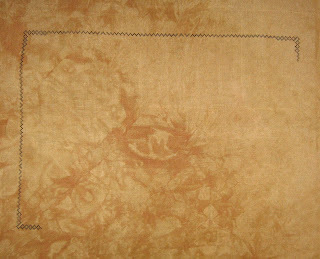 Michele also included some beautiful HDF silk. It was their 33 anniversary and it was a gorgeous weekend for walking all over the city, which they did!! I always wonder if we are like the blogs we write. From reading Michele's blog for a while I already had a good idea of how sweet she would be - and after getting to know her...everything I thought was so true - there couldn't be two nicer people!!! so slowly I came around to this frame. It is called Peacock Repose, by Workbasket (I think) - Anna does not care for the colour blue so I traded out the blues for pinks and I really like how it turned out!! While I was in Alameda picking up the BP Sampler I also had to stop by NIAH. Hunny only had one thing on her mind!!! There was my weekend!! Hope yours was as good!! Thank you all for you kind wishes for Rico's new job!!!!! and Thanks you for stopping by!! Rico just was called back and was offered the job he interviewed for last week!!!!!! Beating out 41 other applicants!!!! Lets all do the happy dance of the new job!!!!!!!!! What a super way to start off the weekend!!!!!!!! Hope yours is as good!!!!! I think that stitching in white is soooooooo tedious!!! So I did not work at bit on the house but instead turned my attention to Wendy's QFRR and worked only on that. I am working my part in the purple colour and am really enjoying it!!! I will have this wrapped up and ready for mailing next week to get it out early as the mail date for the next round in not until July 8th - but as everyone knows I like to get things out early!!! Last night continued the TCM Salute to Asian Images in Film - and they showed Pearl Buck's "The Good Earth" 1937 - The book is so good and the movie is also very good if a bit slow. It was a truly big budget film of the time using non-Chinese actors in the main rolls. The two leads were played by Paul Muni and Louise Rainer. This roll won the Best Actress Oscar for Rainer as O-Lan the quiet but strong wife. Worth a look if you get the chance. Another week - another weekend!!!!! Thanks for stopping by!!! I wonder if it was just my aversion to stitching in whites or the row upon row of white or the two rather odd movies that were playing that made it feel that not too much was accmplished????? 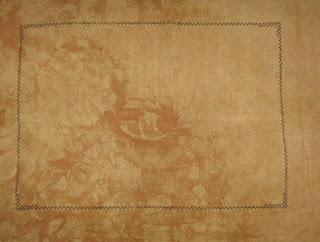 You can see the floss and needle behind the linen which is interesting and odd at the same time. I will keep plugging away at this for the next few nights. I also will finish up the QFRR as that needs to get in the mails next week. The double feature last night started off with "Bam Bam and Celeste" - 2005 starring Margaret Cho and Bruce Daniels. There where some truly funny moments but overall a rather odd movie. The second feature was "Cowboys and Angels" - 2003 a movie set in present day Limerick, Ireland that had more things coincidentally happening to the main characters than is really good for one flick. After those odd films the final flick of the evening was an Anna May Wong film shown on TCM as part of their month long tribute to Asians in Film. The film was "Daughter of Shanghai" - 1937 This film has the great Anna May Wong staring as a Chinese girl who is trying to track down her fathers killers after he is rubbed out for trying to stop the flow of illegal aliens. So the evening ended on a high note!! 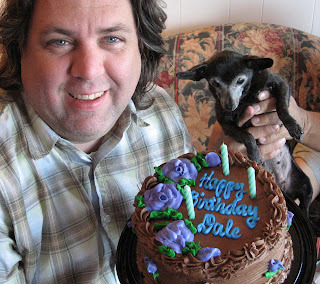 The 3 magic chihuahuas, hag hand and I, the lowly keeper of the bowl bow to your destiny!!!! Congratulations!!!!!! just knowing you are out there really makes this blogging fun!!!! While stitching away I started to re-watch the Sopranos from the beginning. I had forgotten what a creature Tony's mom really was - what a nasty piece of work!!! It is really hard to turn off the TV and go to bed and not stay up watching !!! I need to get on that as I really like knowing what everyone is up to!!!! Exchange received, a Birthday and the Great Blogiversary!! 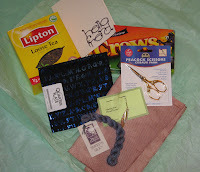 Jill had certainly read my blog as she sent a box of loose tea, Crows (licorice gumdrops) beautiful splotchy fabric a skein of dark floss, a beautiful marking pin, really lovely scissors and a great piece of finishing fabric. I then thought what if the second half doesn't get here...and why didn't Jill just put it in the box?? 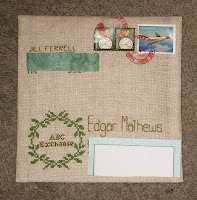 Well the afternoon mail answered both questions as Jill had stitched a gorgeous envelope. I have seen these on other blogs and have really admired them. I just love this piece!!!!! 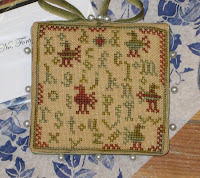 The inside is lined in a fabric with different alphabets - I couldn't get a good snap. This envelope is finished so perfectly. Thanks you so much!!!!!!!! 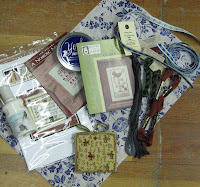 I sent a few of the charts from her wish list - with the button packs - a copy of a CS magazine. I hope you liked everything I sent Lynn - it was lots of fun putting it all together!! Thank you all for stopping by, I do appreciate every comment and all the warm wishes!!!!! Summer havest, a movie and the "Great Blogiversary Giveaway"
The summer fruit is really flowing into the stores lately. We really enjoy fresh cherries and so picked up a couple of pounds yesterday - don't they look super!!! There were also some really delicious apriocots!! The movie I saw while exchange stitching last night was "Tortilla Soup" - 2001 - a really fun movie about a Latino family headed by widowed Martin Naranjo played by Hector Elizondo ( an actor I really enjoy watching) and his three daughters. From the user comments on IMBD - Caroline says - " 'Tortilla Soup' was a "scrumptious" delight. The acting was wonderful, especially by the lovable Hector Elizondo. Although the plotline was not unique, it was an endearing, entertaining, well-done film. I believe that anyone who did not like it missed the point. Give yourself a treat - rent it - and enjoy!!! Also, as a bonus, the food in it looks divine." I thoroughly agree!! To celebrate a year of Blogging I want to do a giant giveaway!!! What I want to do for you my wonderful readers who read my babblings - is a stitchy/San Franciscan giveaway - All you have to do is leave a comment saying you want to get the "Blogiversary SGP." You will have to leave the comment sometime between now Friday, 6/6 and Monday, 6/9 in the morning when I will post again - usually around 7:00 AM PST. That means anybody out there- just leave a note in the comment section!! 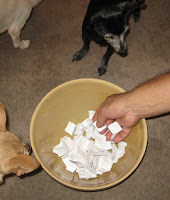 I will then take all the of comments left there and have Rico draw one comment for the Super Grand Prize from the Bowl of Destiny (remember that) on Monday night and announce the winner on Tuesday. I will get the SGP into the mail by the end of June. Don't be shy if you are lurking out there or if you live outside of the US - this is an International Giveaway!!!! But you have to comment to win!!!!! Take care - and remember to leave a comment to win!!!!! 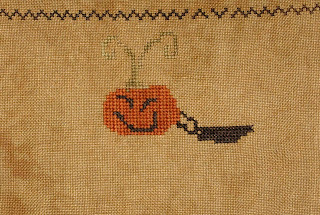 The only stitching was exchange stitching so there are no snaps of that yet..... still waiting on a couple of charts for the Halloween RR to come in so I have not finalized that ...yet. Not too much else going on - Thanks for stopping by!!! We went shopping last night for a new suit for Rico and his upcoming super job interview on Friday, fingers crossed as it is a great opportunity!!!! What we decided on and finally bought was a single breasted in a basic dark charcoal grey with the tiniest of pinstripes of black and light grey - very banker like and conservative! The only stitching related thing I did last night was work on the upcoming Halloween RR. What I did was tape together a few pieces of graph paper to make a really big piece that mirrors my linen. I am taking bits and pieces from a couple of places and placing it all out to see if it will fit. Basically it is me cutting up copies of the different things I want to stitch around and the 7 50 x 50 squares and even drawing the recharting on the paper itself fitting it all on the giant pattern. It seems pretty tedious but I want to make sure that there is enough room everywhere for everything I want include. I hope it isn't to ambitious...... :) I'll take a snap when it is a little more presentable. The movie that I watched while working the RR pattern was "Mrs. Henderson Presents " -2005 with the ever fabulous Judi Dench and Bob Hoskins. What a great movie about a very wealthy widow who buys a theatre in 1937 and continues its operation through the Blitz of London during WWII. I would highly recommend this flick just to watch Judi and Bob work together and play off of each other. A beautiful scissor fob( I have attached them to one of the pair of scissors I got from Carol & Mike), stitch counter and needle finder. Wasn't that the nicest thing to do !!!!!!! Thank you so much Monica!!!! It really was sweet! 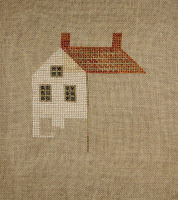 It was a freebie that I had always wanted to stitch and this was the perfect occasion. the other a Christmas present that now needs to get to the framers. The only thing I think I might need to do is fill in the diamonds in the upper box like they are filled in the sampler body - what do you all think?? I got all busy on this after visiting the framers with a finished piece I really wanted to get framed for myself. 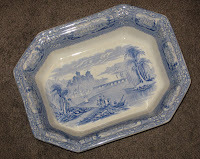 It will be ready in a couple of weeks - I will post a snap of that when I get it back. - but isn't this just gorgeous!!! I think it will be perfect for this RR. That's about it for today - Thanks for stopping by!!! !